Wakefield Hydro-Top is a premium deep penetrating water repellent sealer for many types of porous construction materials such as concrete, pavers, brick, block, stone, stucco, grout, mortar and cultured, faux or manufactured stone. HYDRO-TOP works by penetrating deep below the surface and unlike most sealers. HYDRO-TOP does not become slippery when wet. Hydro-Top has a natural matte finish and will never flake, chip or peel. 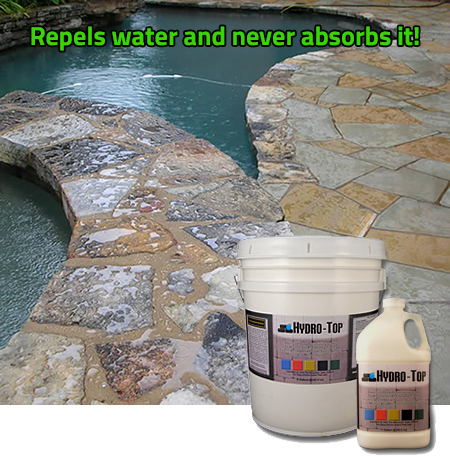 HYDRO-TOP consistently outperforms all other penetrating sealers on concrete, brick., pavers and stone. HYDRO-TOP can be used alone as a high-performance clear penetrating, or over INNERSEAL-DPS as the second step in the Wakefield Stone Sealing System. The Ultimate Stone Sealing System! HYDRO-TOP is the second step in the awesome Wakefield Stone Sealing System. This revolutionary two-step system not only protects, but it also enhances and strengthens your natural, faux or cultured stone, grout and mortar. The Wakefield System is hands down the most effective product available for protecting stone masonry and stopping moisture intrusion that can cause dangerous mold problems within walls.